The Writing Life: Are You Learning from Experienced Pros? Are You Learning from Experienced Pros? It always bothers me when I look at the writing credentials of someone and learn they have written one or two books or just started writing. Yet now they are writing how-to information for others to learn from them. I appreciate their eagerness to tell others what they have learned from their experiences yet to me, they don't have the experience to merit their teaching. When I attend a conference or read a how-to book or read a magazine article, I want to learn from the experienced professionals or people who have been in the trenches for years with depth of experience to pour into their instruction. When I listen to these pros, I hang on their words, take notes and learn from their expertise. I want to give you such an opportunity this week to learn from an experienced publishing professional. From my experience,the online information is often conflicting. Here's some possible questions: What is the most effective way to promote your new book? Or your new novel? How do you find a good literary agent—especially as an unpublished author? One of the best ways to get answers to these questions--and others--is from an experienced person. Keep reading because I'm going to give you such an opportunity. 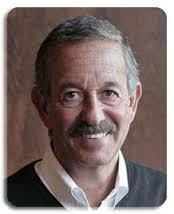 This week on Wednesday, August 31st, I'm interviewing Rick Frishman who is in his 40th year in publishing. For many years, Rick ran one of the largest public relations firms in the United States—Planned Television Arts in New York City (now called Media Connect). Rick has a huge list of bestselling authors that he has worked with and helped them propel their books into the marketplace. For over ten years, Rick has been the publisher at Morgan James Publishing. He knows this publishing industry inside and out. Here's your opportunity: I've convinced Rick Frishman to go on the hotseat for my questions during a LIVE 45-minute telewebcast on Wednesday, August 31st! Rather than have the “content” come out of Rick's head (or my head) for the August 31, 2016 telewebcast at 6 p.m. PST / 9:00 p.m. EST, I decided to let you ask Rick a question. So, if you could ask Rick Frishman ANY question you wanted about attending a writers conference like Author 101 University, what would your question be? Here's your chance to ask Rick directly and get registered for our call on Wednesday, August 31, 2016 (starts promptly according to www.Time.gov). You will receive a FREE copy of Rick Frishman's new ebook, Tips: The Top Twenty for Authors excerpted from his book, Author 101 that Rick wrote with Robyn Freedman Spizman. It's FREE if you ask a question and register for this telewebcast. recorded and everyone who registers for the event will receive the replay recording. Of the many people I know in publishing, Rick is one of the most experienced. I hope you will bring on your hard questions about various aspects of the publishing business. I will be reading these questions and then asking Rick on Wednesday. I hope to speak to you soon on the call. Here's one final detail about our call on Wednesday: During the call you will learn more about Author 101 University which has been a huge influence in my own writing life. The next Author 101 University will be in Los Angeles October 20, 21 and 22nd. Until Labor Day, the price for the conference has been reduced to only $197 AND bring a friend for FREE. Here's how to get an even better deal on this spectacular event: use my coupon code TERRYGUEST then it will save another $50. 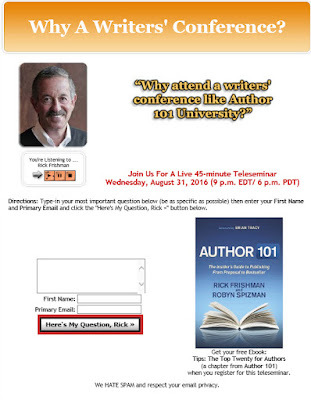 Hope to see you at Author 101 in October—and to be speaking with you on the LIVE teleseminar on Wednesday with Rick Frishman. Thank you for the feedback. I appreciate it.